Celebrated during the first nine days of the ninth Chinese lunar month (early October), Kin Jay is a time of penance and purification of both body and mind. To attain this goal, followers abstain from eating meat, animal products and strong smelling vegetables such as onion, celery, garlic and certain spices. Festival activities are centered on Chinese temples where ascetics perform extraordinary feats such as body piercing and fire walking. Visitors are welcome to observe street parades and events, and of course sample the delectable Chinese and Thai vegetarian foods. 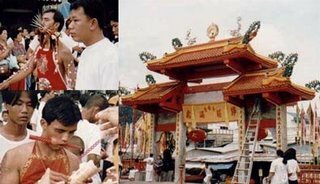 Welcome to Kin Jay Vegetarian Festival at Bangkok in Thailand.